There are so many acne myths out there that we’ve lost count. 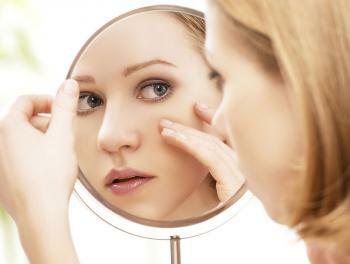 Many people believe bad washing habits, certain foods, sugar, dairy or gluten are causes of acne. Guess what? They’re not. For some people, these factors may contribute to exacerbating the problem, but they’re not the cause. So be smart. By educating yourself on what causes acne, you empower yourself to make an informed decision about how to treat your acne and how to live an acne-free lifestyle. 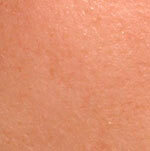 Acne is a disease of the sebaceous hair follicles. 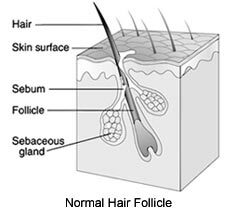 At the base of each hair follicle is a gland called the sebaceous gland, which makes sebum. Sebum is an oily substance, which under normal circumstances travels along the hair follicle to the surface of the skin. Sebaceous glands are most numerous on the face, chest, back, neck and scalp; consequently, these are the most common sites of acne. In acne, the normal transport of sebum out of the follicle is impeded which leads to an accumulation of sebum providing an enriched breeding ground for bacteria. Cleansing with soap is not capable of removing the bacteria entrapped at the base of the hair follicle. 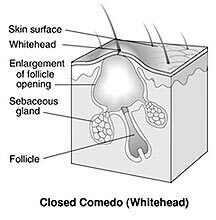 The rapid growth of the bacteria in combination with the accumulated sebum cause the follicle to enlarge and can result in a mild form of acne called comedones (blackheads, open comedone or whiteheads, closed comedone) both of which are non-inflammatory. The acne may progress to an inflammatory type of acne lesions that are red in color called papules, pustules and nodules. Papules are the earliest stage in the development of what are normally considered the typical "pimple". Papules are an intermediate in the progression of acne between the non-inflammatory and inflammatory stages. The next stage is the development of a clearly inflammatory lesion called the pustule, which contains limited number of bacteria and pus below the surface of the skin. Nodules or cysts are the most advanced and severe form of acne. Nodules result when the contents of a comedone expand from the follicular region to the surrounding tissue causing a local inflammatory reaction that may damage the skin. Androgens (testosterone) will increase the size of sebaceous glands, and, in people prone to acne, increase the production of sebum. Pores can become clogged with dead skin, sebum and bacteria leading to the formation of a microcomedone (microscopic lesion). In women, fluctuations in estrogen during the menstrual cycle change the sensitivity of sebaceous glands to androgens. During puberty, the skin cells lining the follicle shed more quickly, mix with the increased levels of sebum and increase the likelihood of the pores becoming clogged. The clogged pore replete with sebum provides an ideal environment for the rapid growth of skin bacteria; Propionibacterium Acnes (P. Acnes) which secrete chemicals into the skin that stimulate an inflammatory response. from recurrent Acne. Acne Vulgaris.